Had I stretched beyond my juvenile thoughts and given A Street Car Named Desire a go perhaps I would have shut me trap and accepted that Tennessee Williams is one of the great playwrights of the 20th century. I didn’t quite know what to expect going into the theatre tonight. I had never read the play, but I knew Williams wrote on the heavy side and that I was in for an experience. I wasn’t prepared for the ticket taker (who was all of 70) to look at my ticket, back up at me and ask, ‘aren’t you a bit young for a thing like this?’ Young in what way, sir? He may not have expected a 20-something redhead going solo or perhaps a 20-something stepping into a theatre 1/3 full with 15 over 50’s and three other 20-something’s with a buddy (clearly we all have good taste). Whatever the case, sir, no, I’m not too young to be taken for a ride. And what a ride it was. I’ll be honest, I initially found out about this via a friend who got tickets in Canada and is just a big a fan of Gillian Anderson as I am (bigger). The chance to see Gillian on stage, even a live taped production on a movie theatre screen, was something I wasn’t going to miss (you Londonders still have until Friday for the real thing). I am so glad that I didn’t. We all know bits from Street Car whether we realize it or not. The whaling “Stella!” that Stanley grounds out toward the end of act one and Blanche’s “I’ve always relied on the kindness of strangers” are the most common. That was about all I knew going in. The bare bones set that revolves in the round was an amazing feat of design. I wasn’t expecting a classic play in an experimental environment and was pleasantly surprised. Theatre in the round is such an amazing experience. The audience surrounds the actors in this cocoon of energy and it just presents a very different experience from proscenium theatre. Amazing. I wish I had been there in person. The opening of the play is a tad confusing. We don’t know these people yet and, short of names, we have no idea where we are being led. Vanessa Kirby as Stella and Ben Foster as Stanley paint a picture of simply life. A two room apartment where nothing and no one exists but them, their love an their marriage. Until sister Blanche shows up on the door step. Gillian Anderson enters looking like a glammed up movie star in a white coat and dark sunglasses, toting a Louis Vuitton bag (and the southern drawl of a socialite from Mississippi). Blanche is just the thing to introduce a little anarchy into the simple world of Stella and Stanley. But where else is she to go? It takes a painful act to find out that she has nothing and no one. Blanche keeps up her facade of ‘visiting in law’ as long as possible, but the cracks in her foundation of lies soon begins to crumble. Blanche DuBois is a heartbreakingly realistic picture of the insanity some of us keep locked up inside of us. I always thought of Williams’ characters as caricatures; seemingly unreal and yet palpable and able to strike a chord. Gillian delivers a raw and deeply painful Blanche in act two that made me squirm in my seat at the back of the movie theatre from unease. Her highs were high, but her lows were rock bottom. What a roller coaster ride. Her monologue about watching loved ones die in act two is the screaming we all feel when we let a beloved go. Blanche lost herself long ago, long before she lost her mind. What a powerful and tragic experience. The cast was simply stellar. Vanessa Kirby’s Stella was lovable and so sure of herself. I absolutely adored her honesty. Ben Foster’s “STELLA!” rattled my teeth. His portrayal of Stanley was brutal and real. This man has lived and won’t put up with anyone telling him he is trash. The way he and Gillian met each other blow for blow throughout their clashes was just phenomenal. And of course, Gillian Anderson impressed the hell out of me. I know she is talented, I have seen her film and TV work, but to take her out of that and see her do live, uncut, no retakes theatre is just such a pleasure. Blanche DuBois is one of those characters that you can tell is draining on an actor to play, but I’m sure it is that much more fun, exciting and fulfilling. Congratulations to the entire cast, creative team and the Young Vic. Theatre like this, this raw emotional roller coaster in a modern experimental space, this is the kind of theatre I love and want to create. This is the kind of theatre that reignites the spark for those of us that feel the candle burning out. If you are lucky enough to have a repeat showing of this near you, run, don’t walk, to your computer and get a ticket. You won’t be sorry. 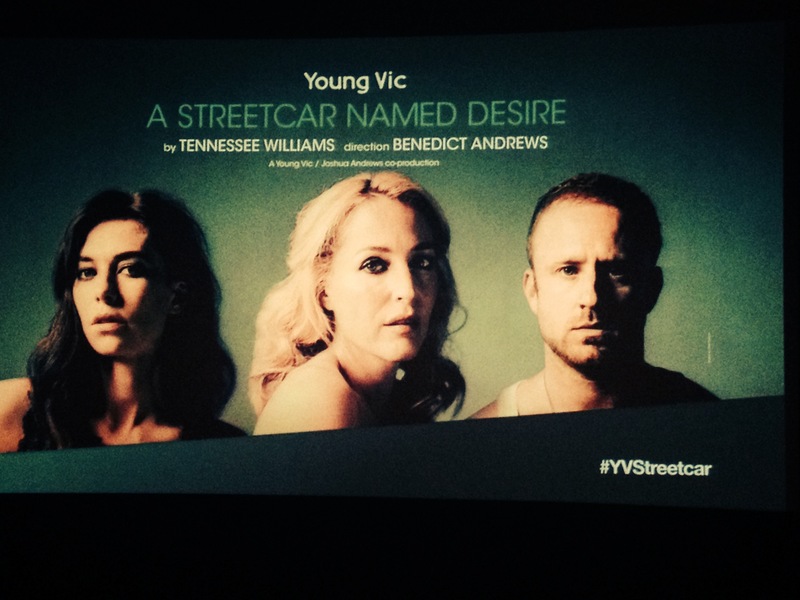 This entry was posted in event, Live Theatre and tagged A Street Car Named Desire, Gillian Anderson, Theatre, Young Vic, YVStreetcar. Bookmark the permalink.